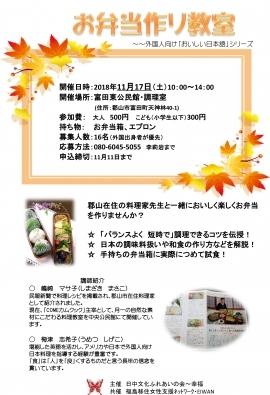 On November 17th 2018, there will be a bento cooking class for foreign residents. You will get to learn how to make healthy Japanese cuisine. Also, you will learn Japanese cooking techniques such as how to use Japanese seasonings and how to prepare food in a short time. The teachers will be two cooking experts living in Koriyama. Please feel free to sign up if you are interested.